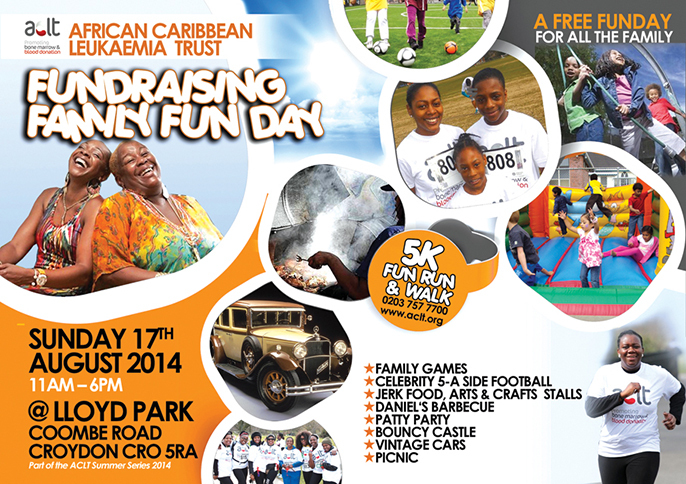 London leukaemia charity ACLT (African Caribbean Leukaemia Trust) announces the ‘ACLT Summer Series 2014’ – a series of events designed to entertain all ages, providing great ideas for the best summer days out for families and friends over the summer months of July - September 2014. For the first part of the ACLT Summer Series, the charity will kick off with Daniel’s Barbecue (4th July – 7th September), followed by the Patty Party Weekend (1st August- 3rd August) charity fundraisers. On Sunday 17th August the ACLT Family Fun Day in association with authentic world foods company Tropical Sun will take place at Lloyd Park, Croydon – a fun filled family packed day of arts & craft stalls, a food corner and entertainment for the kids. For those with a competitive nature, why not take part in the traditional egg and spoon or potato sack race? If that’s not enough there will also be a penalty shoot out a game of rounder’s open for all ages! Just put your name down on arrival. From 11am the inaugural ‘ACLT Giving Hope 5k Family Fun Run & Walk’ will take place, providing an opportunity for friends and family members to do something great in support of the charity. We’re happy to announce Gogglebox stars Sandi & Queenie will be taking part too, so in order not to miss avoid racing with these fabulous ladies, make sure to get to the start line early! If that’s not enough, we have more celebrity friends of the ACLT joining us on the day to take part in the first ever ACLT Celebrity 5- A Side Football match! For 2014 the ACLT has developed Daniel’s Barbecue (part of the ACLT Summer Series of events) in honour of ACLT charity inspiration, ex leukaemia patient Daniel De-Gale - the first Black UK individual to receive a non related bone marrow transplant in 1999. Daniel went onto live a happy life alongside family and friends for several years; however in October 2008 sadly passed away due to an unrelated health illness. The aim of Daniel’s Barbecue is to create a fun and interactive flagship annual fundraising event for supporters of the charity to participate in. Make time for what really matters by holding your barbecue in Daniel’s name this summer. Visit www.aclt.org/danielbbq/ to get your Daniel’s Barbecue Kit today! Another exciting event added to the new ACLT Summer Series is the Patty Party Weekend. An event to take place at home or place of work with friends, family or colleagues where for a few hours you can sit back and relax to enjoy a much deserved chat whilst enjoying a patty or two or three! Those with baking skills can make their own, and those without the time to bake can purchase a selection of patty’s from their local bakery, simples! Once your armed with your selection of patty’s, invite some people to enjoy the patty’s and have a drink with you, requesting they leave a donation with you in your collection tin which will go to the ACLT to support individuals living with blood cancer and other life threatening illnesses. TV personality Chucky Venn is the first to have confirmed his participation in the Celebrity 5-A Side football match at the ACLT Family Fun Day in June, at Croydon’s Lloyds Park alongside comedian’s Wayne ‘Dibbi’ Rollins and Curtis Walker. With female and male mixed teams; we also have the hilarious comedienne Jocelyn Jee Esien (aka Little Miss Jocelyn), this will definitely be a game not to be missed! Make sure you get to the side lines quick to secure a good space to cheer on your favourite celebrity! 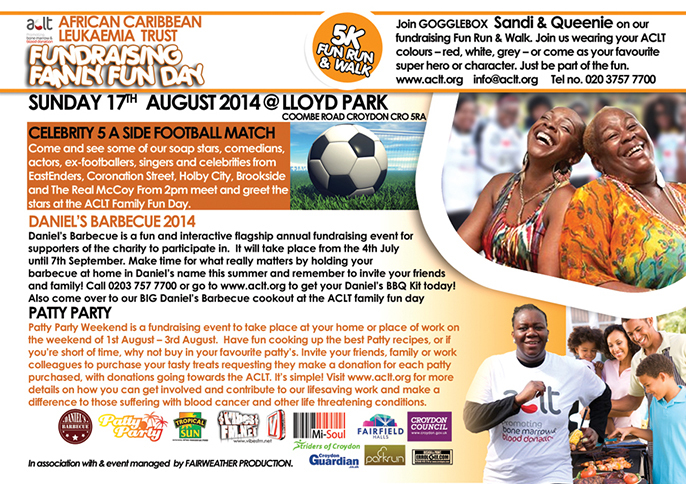 The ACLT Giving Hope 5K Run & Walk will take place in the morning within the woodland settings of Lloyd Park, Croydon and we’re pleased to have Gogglebox stars Sandi & Queenie supporting! They will be taking their mark at the start line from 11am so if you’re a fan, don’t be late! The ACLT Giving Hope Fun Run & Walk is strictly about fun for the family. No times, no pressure, no sweat is required! Just come with a smile and lots of laughs! The fun run & walk is an ideal way to accomplish your personal goals; whether you are raising money for the ACLT or remembering a loved one. So Mum’s bring your prams, Dad’s bring the toddlers, older siblings dress up in fancy dress and come together to have fun and raise funds for a special cause! Oh, and if you are a fan of Gogglebox and wish to put your paces alongside Sandi & Queenie, download your registration form for your place TODAY from www.aclt.org and arrive at the start line early! The ACLT will also run a registration drive during the Family Fun Day in order to register new volunteer donors to the bone marrow, blood and organ donation registers. Individuals aged between 16 – 55 who are in good health should visit the ACLT branded registration stall to complete an application form. Attendees should visit the stand to represent their community through donation of Bone Marrow, Blood and Organ, through the ACLT one stop registration which takes 30 minutes and provides the opportunity for the community to come together and save a life. Successful Bone Marrow registrants will be required to provide a small saliva sample or cheek swab. Individuals wishing to become blood and/or organ donors will be asked to complete a short application form. Potential blood donors will be sent an appointment date, time and venue to donate blood for transfusion purposes and organ donors will be added to the database of organ donors and sent an organ donor card.